1. 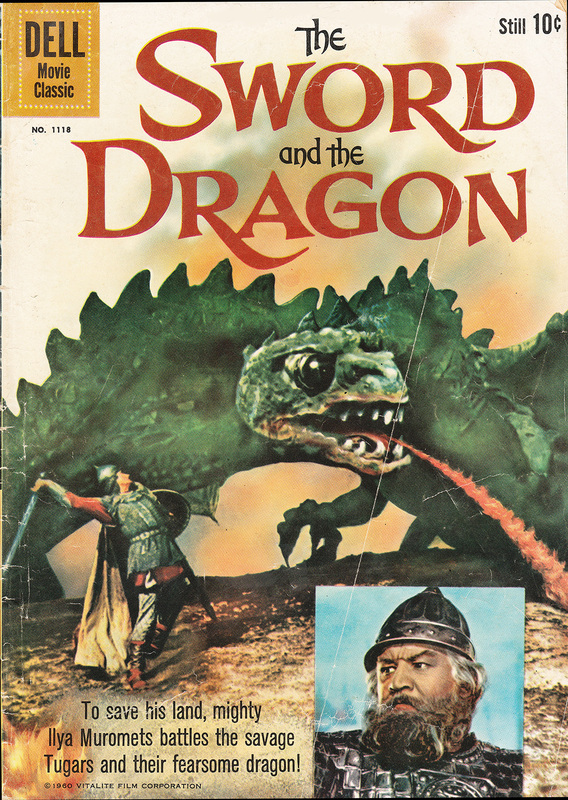 The Sword and the Dragon (1956) - When I was a wee lad, I pestered my Dad until he took me to this movie because... well..it had a dragon in it. Alas, the dragon doesn't appear until the climax, so hopefully I didn't drive my family nuts. Many years later, I learned this was actually a Russian film called Ilya Muromets, which Roger Corman purchased and re-edited for U.S. release in 1960. Dell even published a comic book tie-in and I had a copy. 2. Eegah! (1962) - Probably the worst caveman movie ever made, Eegah! stars Richard Kiel (Jaws in The Spy Who Loved Me and Moonraker) as the title character. A young woman named Roxy discovers him in a California desert and the caveman falls in love (sort of). Arch Hall, Sr. produced, directed, and acted in it. His son Arch Hall, Jr. portrays Roxy's boyfriend. The Halls made several bad flicks in the 1960s, but you gotta love their colorful titles such as Wild Guitar, The Nasty Rabbit, The Corpse Grinders, and, of course, Eegah! Sean Flynn on the set. 3. 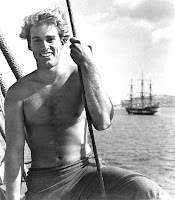 Son of Captain Blood (1962) - Sean Flynn, Errol's only son, made a handful of European movies in the 1960s before deciding that acting wasn't for him. The handsome, younger Flynn's best-known film is this sequel to his father's Captain Blood (1935). A Spanish-Italian co-production, The Son of Captain Blood also starred Ann Todd in the Olivia de Havilland role. Sean Flynn later became a photo journalist who is believed to have been killed in Cambodia in 1970. My father was a huge Errol Flynn fan, so my family saw this one when it played (appropriately enough) at the Robin Hood Drive-in in Winston-Salem, NC. 4. Quackser Fortune Has a Cousin in the Bronx (1970) - A young man (Gene Wilder) makes a living in Dublin by scooping up horse dung and selling it as garden fertilizer. He becomes smitten with an American student played by Margot Kidder. This offbeat Irish comedy was made before Blazing Saddles and Young Frankenstein made Wilder a star. I rather enjoyed Quackser Fortune when I saw it on The CBS Late Movie--back when you never knew what might pop up on that venue. 5. Sol Madrid (1968) - At the height of their Man From U.N.C.L.E. 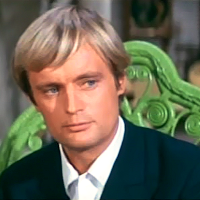 fame, both David McCallum and Robert Vaughn tried to establish themselves as big screen leading men. In Sol Madrid, McCallum played an undercover narcotics agents in Mexico mixed up with organized crime and heroin. At least, it featured a pretty good cast with Stella Stevens, Telly Savalas, Ricardo Montalban, and Rip Torn. 6. The Venetian Affair (1967) - This was Robert Vaughn's post-U.N.C.L.E. effort. Unlike McCallum, Vaughn had flirted with stardom in earlier supporting roles like The Young Philadelphians (1959) and The Magnificent Seven (1960). Of course, that didn't make The Venetian Affair--his attempt at a serious spy film--any better. I saw this one at a theater with my parents when I was 11. I didn't understand it. I'm not sure I would now, though I have become an Elke Sommer fan over the years. 7. The Maze (1953) - A man (Richard Carlson) suddenly breaks off his engagement and moves into his uncle's creepy castle in the Scottish Highlands. A huge maze and a big frog (well, maybe frog-like creature is a more accurate description) are featured in this 3D cult pic directed by famed set designer William Cameron Menzies. 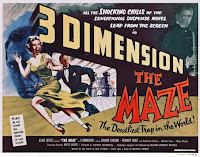 When my wife and I ran a nonprofit film society in the 1980s, we showed The Maze in 3D. We had to turn the 3D glasses upside-down to see the three-dimensional effect. Go figure! You mentioned Elke Sommer in passing. Living in Los Angeles you get to see movie stars now and then, and this time (late '70s) I was driving up one of the Canyon roads (Benedict, Laurel, etc., can't remember which) past big, beautiful homes, most set behind security gates and huge shrubbery. But standing outside a tennis court fronting one property was the most striking female I've ever seen. Blond and tan, her appearance set off by a white tennis mini-skirt and sleeveless blouse. It had to be Elke Sommer. I only had her in sight for seconds, but I remember it to this day. 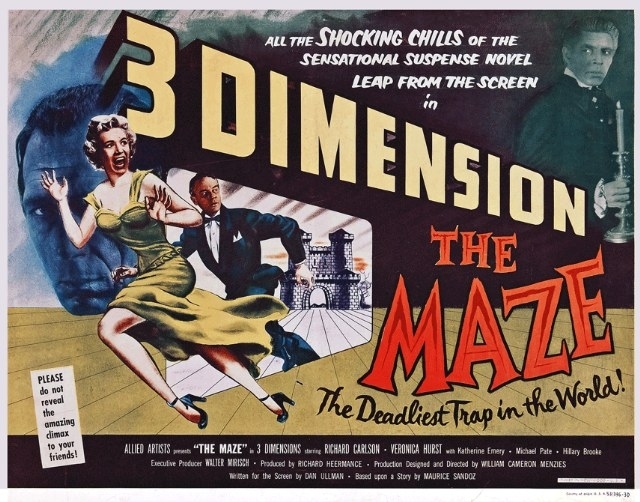 As for "The Maze," it was one of the more creepy movies I remember seeing on TV growing up in the '50s. Not my favorite Richard Carlson role, but it was obviously tough taking care of Uncle Croaker. I asked her about playing tennis when I interviewed her and she said: "I loved playing tennis and I was really good at it--not good enough to be a professional, but good enough to play celebrity tournaments and win a lot of them. They called me “The Brute” because of my topspin backhand, which must have been…well, brutal. " As for THE MAZE, the revelation is a letdown (and just very strange), but the build-up is quite good and Menzies makes it memorable. Was the VENETIAL AFFAIR a post-UNCLE film if it came out in 1967? I understood that within moments of UNCLE's wrapping production Vaughn was on the set of BULLITT. He wasn't the star of that, of course, but did a fine job. I haven't seen any of the above, but the McCallum and Vaughn movies interest me, as does QUACKSER FORTUNE, which must have been done just before WILLY WONKA. 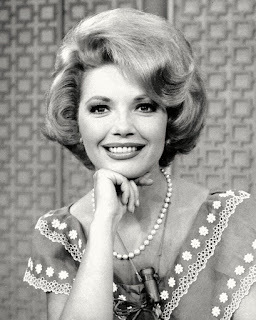 Kidder could only have been a kid, as this would predate her work on James Garner's NICHOLS, which is the earliest I've seen her. As for EEGAH! I've seen as much of that turkey as I want to see in the Something Weird Video intros. Fun post! You're right. VENETIAN AFFAIR came out while U.N.C.L.E. was still on the air. Margot Kidder was around 22 when she did QUACKSER, which was indeed Wilder's film right before WILLY WONKA. Wilder also did the very funny START THE REVOLUTION WITHOUT ME in 1970. Sat Nite Live parodied The Maze - the family in the mansion all having inflatable frog-like thoraxes. No doubt written by guest host Buck Henry. You can find early Margot Kidder all over the tube - hitting on the likes of David Janssen. On Banacek she even makes a prescient Superman joke. THE MAZE is the only one of these I've seen, and it's really not bad at all. Despite being a big Richard Carlson fan I missed it when it came out but caught it on Amazon about a year ago, so it may still be available. Of the others, I've at least heard of 2, 4, and 6, but have no desire to see them. How on earth did you guys figure out you had to turn the 3D glasses upside down? How clever! I love it when you plumb the depths of memory for these titles. 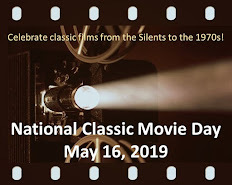 I haven't even heard of most of them although I have a strange and abiding love for Richard Carlson, and I did watch The Venetian Affair for Boris. I didn't understand it. All of these titles are unknown to me, Rick, but a few of them seem interesting – especially The Maze that had to be viewed with upside down 3D glasses. The Gene Wilder flick looks like it has a great premise. It would be good to see him and Margot Kidder this early in their careers. I really enjoy your Seven Obscure Films series...and this batch has some truly obscure movies! I've only heard of numbers 6 & 7, but I am definitely going to check out The Sword and the Dragon. My sister and I have been enjoying Russian adventure films lately.